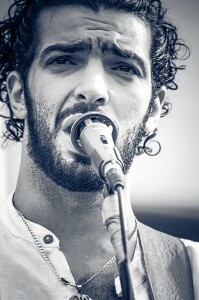 Ramy Essam is known as the “singer of Tahrir Square”. 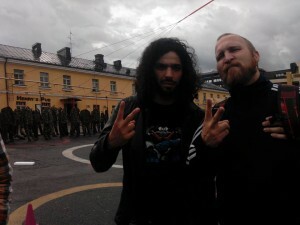 His song “Erhal” (“Leave”) of 2011 became the anthem of the Egyptian Revolution, and until today he continues his songs of protest. Ramy Essam started to write songs at the age of 17, inspired by young poets like Amgad Qahwagi and Mohamed Bahgat, as well as the poet Ahmed Fouad Negm who spoke up against Mubarak’s regime. He established the band “Mashakel” (“Problems”) in 2009 and started to sing for a free life, illustrating through his lyrics the simple daily problems lived through by all Egyptians under Mubarak’s regime. Hailing from Mansoura, Ramy came straight to Tahrir Square in Cairo on January 30 to participate in the January 25 Revolution. Camping on Tahrir Square, he was recognised as a regular Cairene ever since. Ramy Essam played audiences of up to 400,000 people during the revolution. He was tortured by the Mubarak and later the Morsi regime for his revolutionary activism. Threatened by the likely torture if he was forced into armed service under the Morsi regime, he left Egypt in 2014. 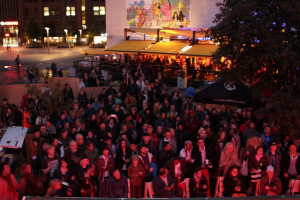 Ramy Essam was hosted at AR-Safe Haven Helsinki and performed together a few nights later at the TO THE SQUARE 2 festival. Ramy Essam released new albums in 2015 and 2016, and has been touring Europe and the United States He is currently recording his next album, co-produced by AR, to be released in 2017. Time out London put Ramy Essam’s Irhal third on the list of the “100 songs that affected humanity”.